Bloodstone is a variety of Opaque Chalcedony. It is dark green with red spots and blotches. It is also known as Heliotrope, from the Greek meaning ‘sun turner’, although the derivation of this name is not known. In the Middle Age, the red spots in Bloodstone were thought to be spots of Christ’s blood, and special magical powers were attributed to the stones. Bloodstone deposits have been found in India, China, Brazil, Australia, and the USA. 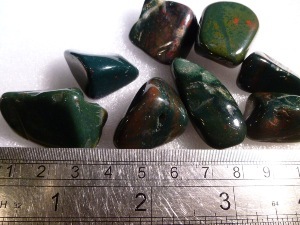 Bloodstone is said to instil courage and assists one in taking the right action. It may help one fulfil one’s commitments in the face of obstacles. Bloodstone is said to keep one from becoming discouraged when one meets obstacles on one’s path. It may assist one in feeling capable and self-sufficient It said to strengthens one’s sense of connection to the Divine, revealing feelings of isolation or loneliness as illusion. 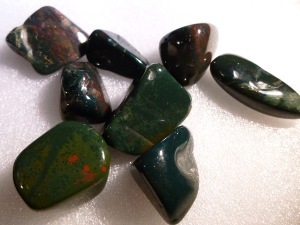 As the name suggest Bloodstone is said to be useful for all types of blood ailments. It works at the source of the blood, within the bone marrow. It may assist in strengthening and fortifying the blood and overcoming blood weakness such as anemia. It is said to stimulating to the liver and the endocrine system. It is said to also be useful in balancing female hormonal imbalances and helping to stabilise the hormones throughout menopause. It’s physical benefits are said to may help circulation, anaemia, blood cells and blood toxicity, menstruation, safe childbirth and reduction of labour pains, burns, scalds, arthritis, rheumatism, sense of small, circulation, heart conditions, bypass and translates, exhaustion. Red Jasper is also said to bring courage and was known historically as a stone of vibrancy and endurance. According to Viking and Germanic legend, the hilt of the magical sword of Siegfried, the dragon slayer, was inlaid with Red Jasper to bring him courage. Today, Red Jasper is still known as the Stone of Endurance, a gentle, but vital, stimulator of chi, or Life Force, bringing physical strength and energy, stamina, focus and determination. Bloodstone (Blood Jasper) tumbled to a smooth finish, an ideal pocket size stone, small enough to carry around with you. Tumble Stones can also be placed around the home for their energies or can just be nice decorative items. Bloodstone (Blood Jasper) crystal gemstones of varying sizes selected specially for your order.